Apple has issued a set of new iPhone commercials, one focusing on the devices high resolution camera, and the other emphasizing the Touch ID fingerprint reader. Both ads are airing now and are a bit lighthearted, if you watch primetime TV you’ll likely see them shortly, otherwise they have been embedded below for easy viewing. The “Onions” ad is a bit comedic, riffing on the art world, popularity, internet memes, and the preposterous nature of hype in our modern world. It all starts off with a girl filming who is presumably her mom cutting onions, and it quickly rockets off into a realm of utter absurdity from there. 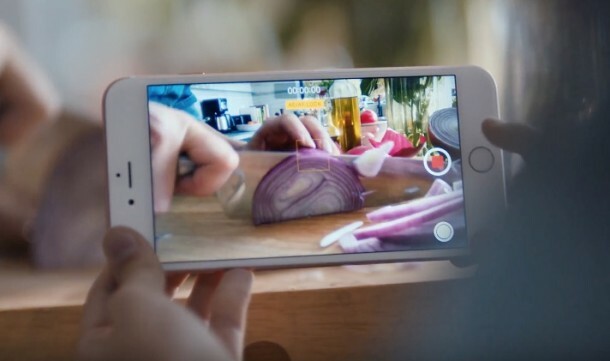 The commercial aims to show off the ability to shoot video in 4K with the iPhone camera. “Fingerprint” features various uses of the Touch ID sensor, showing individuals checking their flights, a guy stuffing his face with donuts, another person buying a boat, checking a bank account, and some other activities with the assistance of Touch ID. Apple has been running many other commercials recently, focused on most of their mobile product lines. My personal favorite from the modern batch remains the amusing Cookie Monster ad. Things are tough all over. the “onion” ad in particular, has a feeling of desperate relevance. I have a 6s Plus. Sorry Apple, people just aren’t that INTO you, at the moment. I guess there’s no accounting for taste. One of their best commercials imho. And, ‘people just aren’t that into’ Apple? Half the people I meet have either an iPhone or a Samsung. In my book, that’s not doing bad at all. I like these ads because they can also be applied to the iPhone SE. Woo for inclusion! Really? Stuffing his mouth with donuts is going to make people want an Apple? I agree, I think that iPhone donut commercial is gross and crass. I think the Onion commercial is funny because it makes fun of the stupidity of our modern Warhol-esque dystopia where every nobody attempts fame for something outrageous, offensive, or stupid. Social media is a bane on society, it breeds and feeds narcissism in an already self-centered me culture, and the iPhone is a useful tool but everyone is glued to their screens like it’s heroin. The Baby Boomers were the most selfish and self-centered generation ever to walk on earth, but the kids are going to give them a strong run for their money on narcissism alone. Obsessed with likes and hearts and followers, who cares? All of it is irrelevant. Yet some jobs are now demanding to know applicant social media profiles to see if they have sufficient followers and engagement so they can use their personal me-feed to blather about their corporate ball and chain. No wonder, politically speaking, everyone on both sides are missing the “good old days” before all of this garbage came to pollute us. who was that boy who wearing white jacket and black I want to know her name ?